a window in my craft room. Now that we got rid of all the weeds, we made a little pathway. along our new, garden path. She tells me that next year I will be trimming these little, delicate plants away from the stones. I'm still so skeptical about planting something in the ground and thinking it will grow. under the arbor to the lower yard. they add a little color and inspiration for my soul. it used to hang in the courtyard of my desert home. 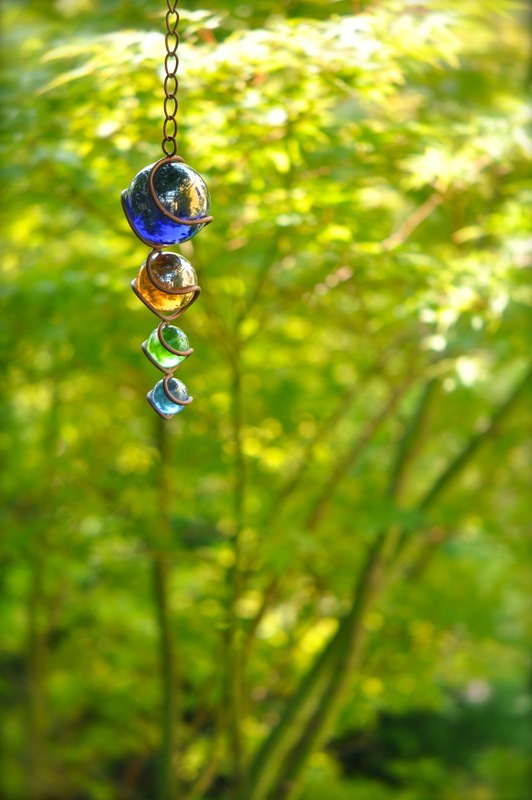 Do you have a favorite piece of garden art? What a beautiful pathway... So lush and green overhead. It will be even more lovely when the ground cover grows in! Love it! My favorite piece of garden art is a clay bell I made in a pottery class. Looks like you're settling nicely. Making your home so pretty. 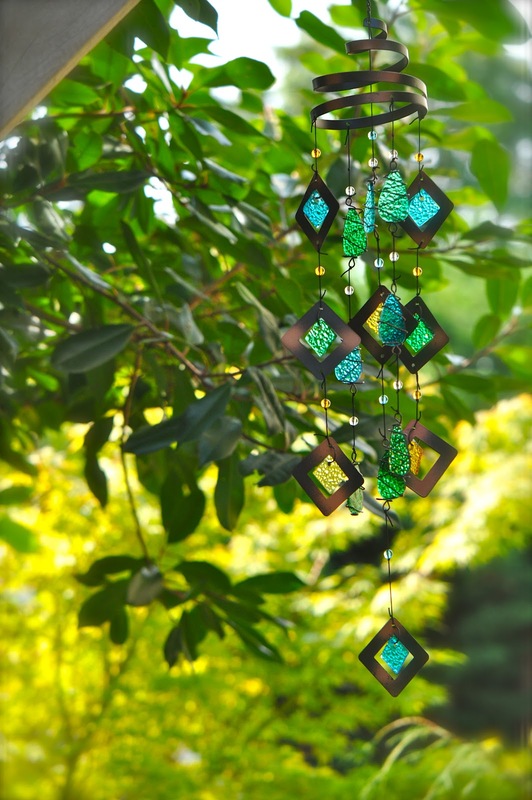 LOVE your photos and the pretty colors of your wind chimes..
You are going to have so much fun in your garden ... it will be a wonderful adventure! Love the glass *danglies*!!!!! Oh it is all so green and wonderful! So peaceful and lovely! Becca, absolutely lovely, so green and lush. I love your little path, and had to giggle at the ground cover...here's it classified as a weed, but I love to see it growing in my grass. Those bright blue flowers are so pretty. I think it is a type of Pratia, or Blue Star creeper. But I could be wrong, either way it's lovely, and so is your path. How pretty! I love all of the color. I'm currently dreaming of some garden re-work of our own. Your new garden is beautiful and I can just imagine how pretty your garden art is when the sun is hitting it. Hey, it's pretty even in the shade. Love your path. your idea is good, keep it up. people like different activity. I love your idea. Don't forget that funny is happiness. What a terrific little garden path Becca! 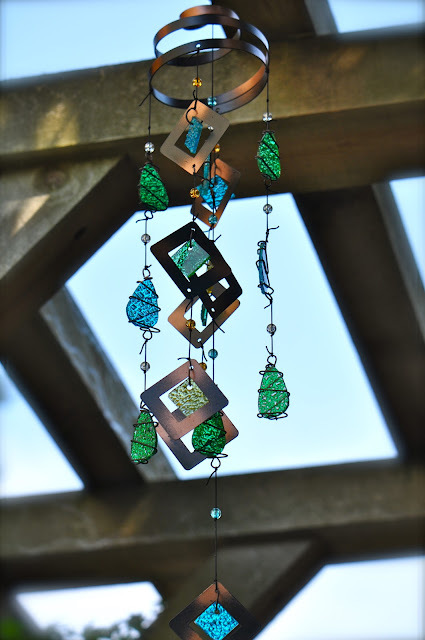 With all the pretty green and lovely wind chimes and colors, it is looking like you have yourself a little piece of heaven! Beautiful! it's all so pretty and relaxing looking! I love your garden path and all your garden art. I would love to have a little area like that at my house. I love seeing your pictures, so thanks for sharing. 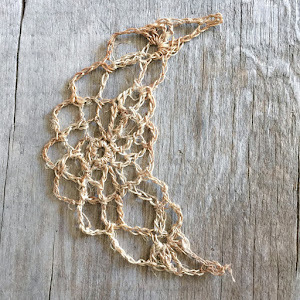 I forgot to mention how much I love your new banner on your blog! It looks so great Becca!! Ooh, I love your garden art! All that beautiful glass...looks like a special place, that secret garden. 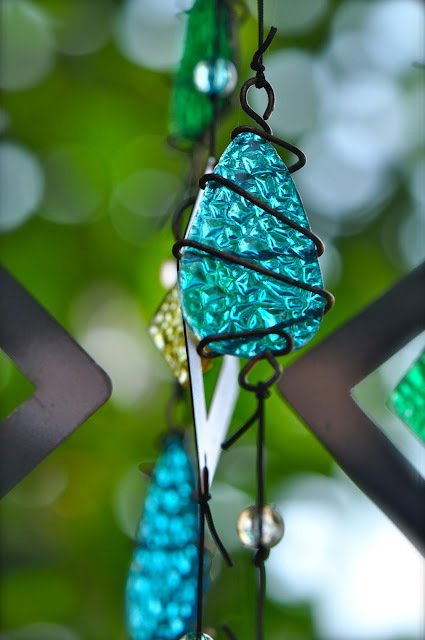 The pathway leading to your secret garden is inviting and the glas and bead decorations are wonderful. Your corner of the world is a little piece of paradise, Becca! I love all your many, colorful wind chimes! I love such things, and have two...but I don't have them up currently. We've had terrible weather this summer, often with gale-force winds. Oh, and must day, LOVE your new banner--it's very YOU! :o) Lovely to catch up with you after a brief hiatus! Happy Weekend ((HUGS)) P.S. So glad you enjoyed the newsletter so much. Oh, Becca! I've been 'gone' for a little while (in my garden, actually - all summer! =]) and the very last I saw, you were on your way! Now, you're quite 'there' and settled in, apparently. How wonderful! and HOW LUSH! You must just be loving it! and a garden!!! 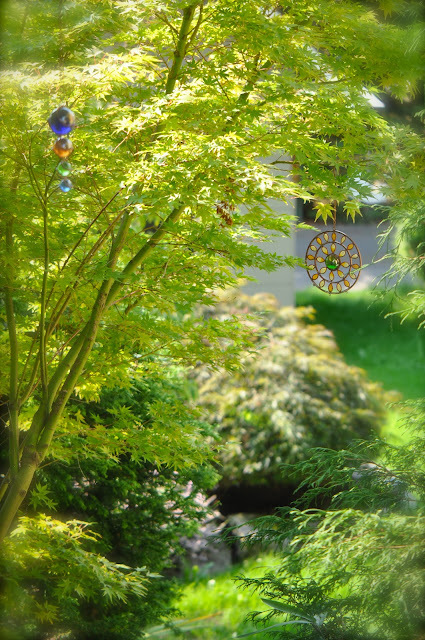 and it's so restful to visit - with the sound of the birds and the windchimes, I feel like I'm acatually there walking down your path. So good to visit! Now, off I go to catch up! =] I'm so happy for you! Your pathway is beautiful and will be so charming next year when the little plants grow - and yes, they will! I learned that the hard way when we moved down here from the Yukon. To get a beautiful full flowerbed there you had to plant everything extremely close together and I thought that was how it was done everywhere; the first year here I killed more than half my plants by over-crowding them! I'm happy to hear you are enjoying your new surroundings Becca!